The idea of a university: defined and illustrated is endlessly cited, typically by those who take a high view of a university education and see Newman as the most inspiring advocate of a liberal education. The ten public lectures that Newman composed in 1852 are rightly considered masterpieces, for they have inspired debate on the nature and purpose of a university education like no other work in the English language – or indeed in any language. The leading Newman expert Ian Ker describes the Idea as the one educational classic. The Idea has been described by a well-known historian of university education as ‘unquestionably the single most important treatise in the English language on the nature and meaning of higher education’; in it Newman transforms a legalistic description of the university into a thrilling, emotion-laden, higher order conception of education. (S. Rothblatt, ‘An Oxonian “idea” of a university: J. H. Newman and “well-being” ’, The history of the University of Oxford, vol. vi, ed. M. G. Brock & M. C. Curthoys (Oxford, 1997)). The ten public lectures that Newman composed in 1852 (which form the first part of the Idea) are rightly considered educational masterpieces, for they have inspired debate on the nature and purpose of a university education like no other work in the English language. Nevertheless, readers need to be made aware of the background context if they are to make full sense of his arguments and enter into his vision of higher education. The lectures themselves were not composed as an exhaustive exposition or systematic study of their subject matter but as an exploration of a theme; and they were written to deal with particular problems which Newman faced in the 1850s in his attempt to win over and bring together various factions within Irish society. Thus they were not meant to be an exhaustive account of Newman’s educational ideas. The historical context is vital: the purpose of the lectures was not to inspire or guide future generations, but the much more immediate task of winning over his audience in Dublin to the type of university he was about to set up. The Idea is really two books in one, the lectures of 1852 and the occasional papers of 1854–58, published separately in the 1850s and together only in 1873. The third volume of Newman’s educational writings, The rise and progress of universities, does not form part of the Idea, but it is needed to fill out Newman’s idea of the university because it brings out the pastoral dimension. The Idea is about the essence of a university, not its fullness and well-being, and to discern what Newman meant by its integrity we need to look at the idea illustrated in history – at the Rise and progress of universities – and in practice – at the Catholic University in Dublin. Readers need to be made of Newman’s prose style, as vital distinctions are so embedded in the text that the reader can become absorbed by the magnificent prose and distracted from the underlying theme. 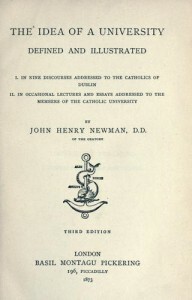 For those prepared to give his arguments the sort of critical attentiveness they call for, the lectures prove how deeply Newman thought about such matters as the relation of college to university, teaching to personal development, and the importance of new knowledge and its limitations in the formation of the human mind. In 1854 Newman wrote twenty articles for the Catholic University Gazette which were like historical snapshots telling the tale of the organic growth and development of the university over two millennia. These ‘university sketches’ were published as Rise and progress of universities, and they form the third volume of Newman’s three works on ‘University Teaching’. It was never Newman’s intention for the Dublin lectures to be taken in isolation from what he saw as three companion volumes on university education: the Dublin lectures (1852); the occasional lectures and essays (1859); and the university sketches (1856). While only the first two constitute the Idea of a university, all three examine the idea of a university: the first as the idea defined, the second as the idea illustrated, and third as the idea lived out in history. The sketches are not intended to be historically rigorous essays about the development of the university, but a work of historical imagination. Composed in an age when the writing of history was frequently used to instruct or edify, the historical purpose of the sketches is subordinated to the didactic function of opening minds to the world of the university. Newman regarded the promotion of original research as the responsibility not of universities but of academies such as the Royal Society, while at the time he upheld the idea that learning and intellectual scholarship was the distinctive vocation of the academic. Specialisation and obsession with research and publication are not only present today but more accentuated than ever – which is why Newman’s advice is so prescient and of such pressing interest. Nevertheless, Newman felt that research had a crucial part to play in the life of a university. Though Newman saw research as having its part to play in the university, he stressed that the primary function of a university is to teach rather than to undertake research. But he was careful not to draw the line too closely. ‘A professor is not to be overburdened with lectures, that he may have time for the steady pursuit and thorough mastery of his department of science or learning. […] Nor are his duties confined to the lecture hall: in this day, especially, he may be quite as usefully employed with his pen as with his tongue’ (Scheme of Rules and Regulations of the Catholic University, 1856). Newman saw to the publication of Atlantis, a register of literature and science conducted by members of the Catholic University, which was launched in January 1858 as a biannual journal for the scholarly output of the teaching staff. As a heavyweight academic journal under the editorship of the Dean of the Faculty of Science, Atlantis provided an outlet for those academics who had few students to challenge, and it served to raise the academic tone of the University and set its sights high. Each number was about 200 pages in length and included articles of a literary and scientific nature, largely the latter. Overall, however, Newman felt that the proper home of research lay outside the university, albeit in institutions closely connected with it. In distinguishing between the tasks of teaching and researching, Newman argues in the Idea of a university that the capacities for undertaking both are not commonly found in one and the same person, since research demands isolation and concentration, and teaching an external involvement. Newman wrote when pressure for research was just beginning to mount – and long before it had been raised to the level of an ideology. He insisted in his lectures on the central teaching function of the university and the wider emphasis on character development. Newman argued that precise and accurate reading, rather than merely wide reading, is the key to educational progress, and it encapsulates the approach that he championed against those who urged a superficial omniscience. The paradox was that someone who never studied at a university might well gain a more genuine education than a university graduate. The great teacher of Newman’s undergraduate days was Edward Copleston who was the first to live out what became the Oxford ideal, multum, non multa. One meaning of the Latin (often given in the form, non multa, sed multum) is ‘much, not many’, though the looser translation ‘depth, not breadth’ gives the sense better. The fuller form of the Latin proverb is multum non multa scire sapientis est, which can be translated as ‘it is wise to know something deeply, rather than to know many things’. Copleston’s abiding claim was that ‘to exercise the mind of the student is the business of education, rather than to pour in knowledge’. This sort of service to society might seem improbable in a world where the university has been all but side-lined from the public conversation; but even if this function had not been superseded by the media, it is likely that the university would have merely contributed to the lack of unity in culture and paved the way for post-modernism owing to its own loss of direction. Instead, universities have new roles assigned to them: witness government obsession with the university as an agent of knowledge creation and, in the West, with social mobility. To the extent that the university neglects its role of nurturing well-formed and educated citizens, it will form adults incapable of participating in the institutions of social and political organisation: and that failure is tantamount to an invitation to government abuse, or, worse, tyranny.